Spider plant | Infonet Biovision Home. Young leaves of spider plant are widely used as spinach in Africa. These leaves can be dried and stored for later use, usually as a relish eaten with maize meal. This food is rich in magnesium and iron, as well as nicotinic acid. Geographical Distribution of Spider Plant in Africa. Source PROTA. Updated 28 November 2018. Spider plant is an erect herbaceous annual herb with hairy, often purple stems and many branches growing to a height of about one metre. The plant has edible leaves; each leaf has up to 7 leaflets spreading like fingers, which are usually 2-10 cm long and 2-4 cm wide. 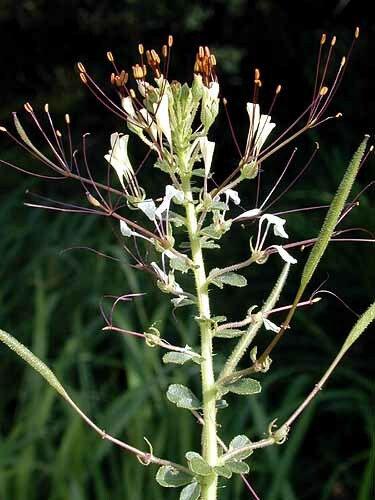 The flowers are rather showy, long and bearing many small white or pink flowers. The elongate fruit resembles a pod, but is referred to as a capsule, containing many small, dark seeds. Spider plant originated in Africa and Tropical Asia but now has a worldwide distribution. The plant is either cultivated or harvested from the wild. It is a fast-growing plant that is ready for harvest in as few as three weeks. The leaves are eaten as a cooked green vegetable, have a mildly bitter taste and contain 5% protein, 6% carbohydrates and are high in vitamins A and C, calcium, phosphorus and iron. Spider plant is used as a vegetable, and as such adds important nutrients to the diet in rural areas of East and Southern Africa. The leaves are usually cooked when fresh but may also be dried and stored for up to two years although this practice greatly reduces the crop's nutrition value. In East Africa, fresh leaves are used as ingredients in other mashed foods, and the dried leaves are ground and incorporated in weaning foods. Spider plant is believed to replenish blood and therefore referred to as a "traditional meat" by some Kenyan communities (Chweya and Mnzava, 1997; Savala et al, 2003). Spider plant is commonly found throughout East and Southern Africa during the rainy season. (AVRDC). In Kenya, it grows from sea level to 2400 metres (Savala et al, 2013). The crop grows well during the warm season under irrigation. Spider plant is sensitive to cold and does not grow well when temperatures drop below 15 degC. It thrives on sandy loam soils but does not perform well on wet, marshy and heavy clay soils. It requires exposure to sunlight and does not do well in the shade. 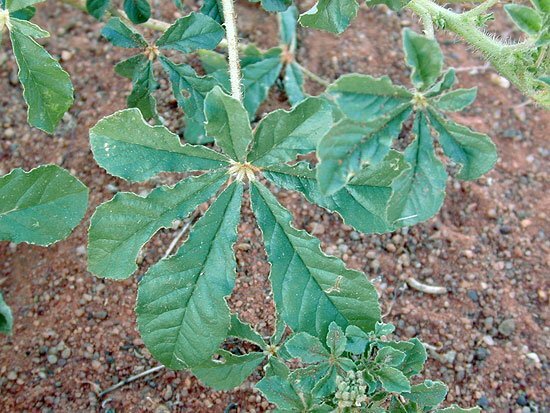 Although the plants are able to tolerate short-term drought, periods of drought will hasten development of flowers and lower the yields (AVRDC). Seeds should be sown at the onset of rainfall. This ensures availability of adequate soil moisture throughout the growth period. When rainfall is inadequate, frequent watering is necessary during the vegetative growth period (Chweya and Mnzava,1997; Savala et al, 2003). Propagation is done by seed. Seeds are sown directly in a well prepared seedbed. Transplanting has proved unsuccessful. (EcoPort) Seeds can be extracted when the pods are fully ripe (yellow or black), but before they open naturally. Seeds should be kept in a dry, closed container for at least three months to reduce dormancy (AVRDC). It requires a well-prepared seedbed without weeds and dug to a depth of about 15 cm followed by a light harrowing. It may be planted on traditional raised or flat beds. After digging, the soil is harrowed to a fine tilth. Organic manure is applied and worked into the soil. The seedbed is then levelled before planting. Plants can be grown on flat beds or on traditional raised beds, which are normally one m wide. The appropriate bed length depends on the amount of the crop to be grown, but may not exceed three metres. There are usually narrow pathways between the beds to facilitate weeding and harvesting. These pathways also act as drainage channels during the very wet season, as plants do not withstand waterlogging. When raised beds are used, application of organic manure is delayed until the beds have been dug (Chweya and Mnzava,1997). Shallow planting at one cm depth and with 30 cm between rows or broadcasting followed by raking on prepared seedbeds is recommended. Some farmers mix the seeds with sand when broadcasting them. About four g of seed per m2 or 40 kg per ha are required. Emergence is normally from 6 to 8 days after sowing. Thinning is done three weeks after emergence to leave 10 to 15 cm between plants (EcoPort). Plants do not have dense foliage, and as such are unable to compete with weeds. It is therefore essential that seedbeds are kept weed-free at all times, but especially during the first six weeks. Shallow cultivation or hand-pulling of weeds should be practised (Chweya and Mnzava, 1997) Spider plant responds well to well-decomposed manure. Flowering is delayed when adequate manure is available, allowing more, larger leaves to be harvested. The first harvests consist of thinned plants. Plants are brought to the market with their roots attached; roots are removed just before selling to maintain freshness. Where possible, roots should be placed in water overnight to absorb moisture. In case of a mixed cultivation with amaranths or nightshades, spider plants are uprooted to make more space for the companion crop. In case of monocropping, which is more common, the tops are removed 10 cm from the ground. This encourages the development of side shoots. Harvesting is repeated several times, depending on the soil fertility and moisture conditions. The harvested shoots are kept in a bag without water during the night. In the following morning, the shoots are dipped in water for 30 minutes. Sprinkle water on heaps of produce sparingly. After several successive leaf harvestings, the plants are left to flower and produce seeds. Growers harvest the ripe capsules at the end of rainy season, to save seed for the next crop (AVRDC). Harvest the young spider plant leaves including the stem tips then remove the leaf stalks. Wash the leaves with clean water and cut into small pieces. Add 1 teaspoon of salt then vegetables and boil over a medium fire for 10 minutes. Next add 1/4 litre of dilute coconut milk and boil for 10 minutes. When leaves are cooked, mash in pot and add oil (or cow fat). Using a separate sufuria pot fry onions till brown, add tomatoes then vegetables and 1/4 litre of thick coconut milk (or fresh cow's milk), then cook for 5 minutes, stirring occasionally. The above provides 4 to 6 medium portions. It is best served with chapati, rice or ugali. To mix with other vegetables, boil Amaranth leaves and spider plant separately. When cooked, mix both then mash in one pot. (contributed by Maryam Imbumi in Organic Resource Management in Kenya, 2003). Spider plant is a poor competitor with weeds. Weed control at early growth stages is critical. 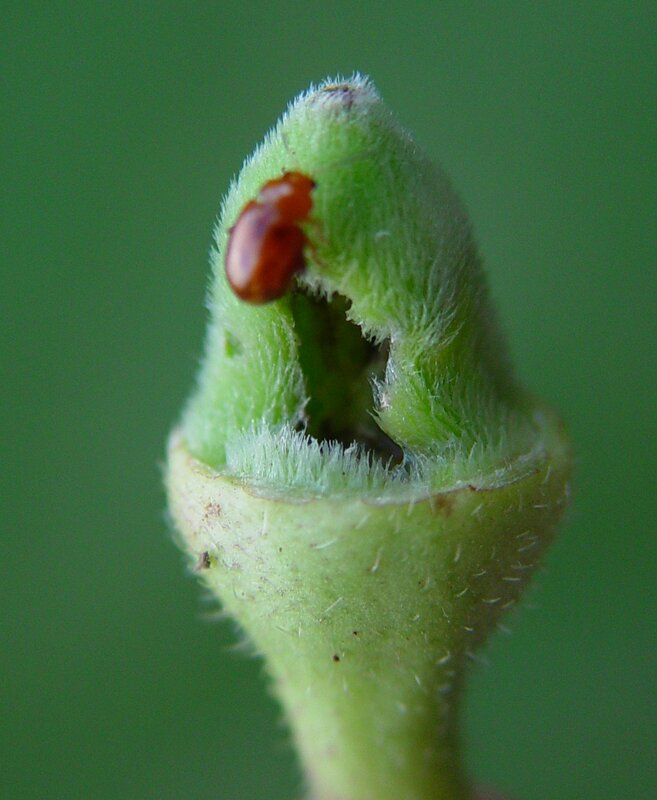 Pure stands in Nairobi were observed to be attacked by flea beetles (Phyllotreta mashonana). (EcoPort: Wilfried Baudoin). Flea beetles are tiny to small with enlarged hindlegs that enable them to jump long distance when disturbed. The adults vary in colour from shiny black or metallic grey to black with yellow stripes on the wing cases. Eggs are laid in the soil near the host plant. The larvae generally feed on the plant roots, but usually do not cause economic damage. The characteristic symptom of flea beetle attack is small, round holes all over the leaf surface. Damage may be of importance when flea beetles are present in large numbers, especially during the seedling stage. Weeding in and around fields may help to eliminate flea beetle shelters and breeding sites, reducing crop damage. Covering the seedbed with a fine-mesh material is useful to protect seedlings. Flea beetle Phyllotreta mashonana feeding on young okra pod. 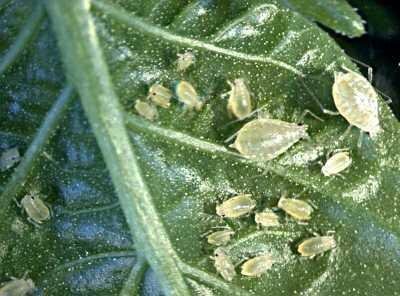 Aphids can be serious pests during dry weather. Aphids are a major pest, causing leaves to curl and become unattractive to customers. Aphids feed by sucking plant sap. Small aphid populations may be relatively harmless, but heavily infested plants usually have wrinkled leaves, stunted growth and deformed pods. Plants, particularly young plants, may dry out and die under heavy aphid attack. Heavy attack on older plants may cause crop loss by decreasing flower and capsule production. Damage may also reduce seed viability. Check the plants regularly. Aphids tend to be more common along upwind field borders and next to other leafy vegetable crops or weeds; so initial sampling should be focused in these areas. Because aphid populations are generally clumped within fields, each field should be uniformly sampled. Destroy aphids by rubbing them off, or by gently pressing the infested stems or leaves between your fingers. This helps controlling low, initial infestations. Apply a strong jet of water to dislodge aphids from attacked plants. When repeated at regular intervals, this method knocks aphid populations down to acceptable levels. Remove and destroy infested leaves. This helps reduce further infestations. Conserve natural enemies. Ladybird beetles, lacewings, hover fly larvae, parasitic wasps and naturally occurring aphid diseases are common and effective natural enemies of aphids. There are no records of plant diseases, possibly as a result of natural plant selection (EcoPort: Wilfried Baudoin). Ouma, M.A. Indigenous vegetable production and utilization in Suba district, Kenya: Improving health, unlocking the wealth in Suba district. BioVision - T.T.U, ICIPE. Unpublished.